I recently lost a friend to Breast Cancer. I lost a co-worker a few years ago and I don’t know anyone who hasn’t been touched by Breast Cancer. 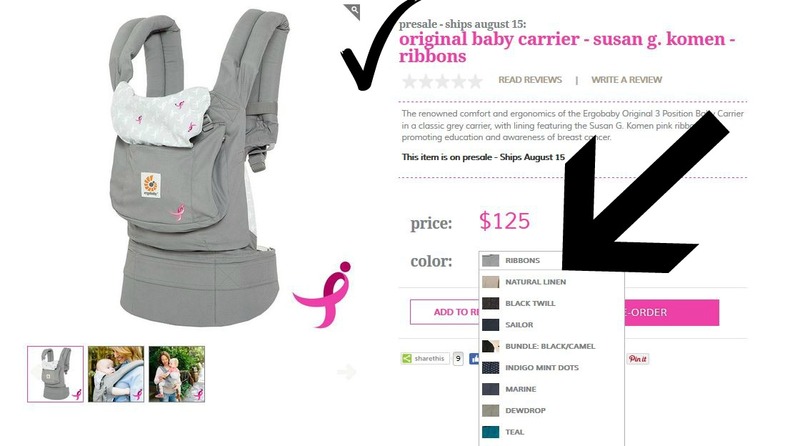 I am touched and happy to share this Susan G. Komen Ribbons Baby Carrier by Ergo. Ergo has designed this pink ribbon carrier, currently on presale, with the promise to donate at least $25,000 dollars to the Susan G. Komen foundation. In addition to the $25,000 donation, Ergobaby will donate $5 per carrier regardless of sales. In other words, if they sell 100,000 carriers they will donate $500,000! In addition to the funding, they are spreading awareness and education through both the carrier and a video that will premier in October. The original 3 position carrier, specially designed to benefit the Komen Foundation, is grey in color with with lining featuring the Pink Susan G. Komen ribbon logo (see below). In addition to the lining, there is an embroidered Susan G. Komen pink ribbon logo on the exterior. This ribbon is a well recognized symbol of education, support and goal to find a cure for Breast Cancer. Visit my affiliate at the Ergobaby website to order this carrier on presale and support (literally) your baby through babywearing, and support the breast cancer fight with it’s symbol and donation to the Susan G. Komen foundation. What a beautiful carrier, both inside and out! Currently available for PRE-SALE, these carriers will ship August 15th! How to get one? Visit the Ergobaby website and click on the Original Baby Carrier. Navigate through the colors and select “Ribbons.” Next, order and wait! While not as a separate item on the website, this can be easily ordered from the original baby carrier page when you scroll through the color choices. What a beautiful combination of a brand I already love plus a wonderful foundation.